If you are a beginner, there are a few things to know before you get started. To make any friendship bracelet, you'll need to know the 4 basic knots. They appear in all of the bracelets. They are the Forward Knot, Backward Knot, Forward Backward Knot and the Backward Foward Knot. 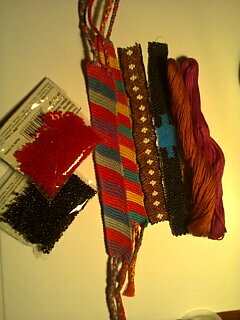 For more info on how to make the basic knots, look at the tutorial on Knots used for Bracelets. There are several different mediums available to use when making friendship bracelets. Embroidery floss, such as Anchor, DMC, or J&P Coats is the most widely used thread for making bracelets. It's 6 stranded, 100% cotton, usually has a luster, and can be separated to make smaller bracelets. When knotted up, the knots look smooth. This is an economical version of embroidery thread. It's 6 stranded and smooth, and it's almost always cheaper. 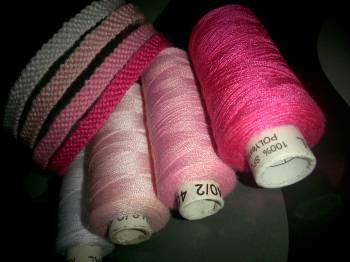 Craft thread is usually bought in packages, and colors are more limited than embroidery thread. Craft thread is a lower quality, so it constantly breaks if pulled too hard. Craft thread has no shiny aspect to it. Rayon: Usually made by DMC, rayon is a silky material. If comes in fluorescent colors as well. Rayon is incredibly hard to keep tied, so it's not recommended for use in bracelets, especially without regular cotton thread to keep it together. Pearle cotton is available in several different sizes. It has a decent variety of colors. 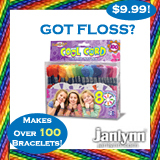 It can be bought in economical packs, which have the same drawbacks as craft floss. Pearle Cotton thread looks as though it's twisted throughout the string, so when braided, it looks almost textured. Yarn makes larger bracelets, so it's ideal to use if you want to make a pattern into a bag. I've had no personal experience with yarn, so I can't tell you what drawbacks there are to it. More info on string can be found in the tutorial on String types. If you look, there are a bunch of diagrams showing you how to make the bracelets. The things you need to know are: Always do two knots, or your work will twist; always work row by row; and know the symbols for the knots. The arrow slanting right is the Forward knot, the one slanting to the left is the Backward knot. An arrow changing direction to point toward the left is a forward backward knot, and an arrow changing direction to the right is a backward forward knot. To change the strings in the normal pattern generator, you click the + on the left hand corner, and to subtract click the - that is right next to the plus. To change color, you can click the top of the thread to change them, and PRESTO! you did it! The code needs to be copied into the first generator in order to be published. The alpha generator lets you create alpha patterns. You create the shape of the pattern you want with the code for your color you want. These patterns are usually used images and names, although name patterns won't be accepted by the moderators. Name patterns can be made using the font patterns on the site. Fonts can be found typing in the word "font" or "alphabet" in the search bar, selecting alpha, and hitting search. Keep in mind that Alpha patterns are made differently than normal patterns. There are 2 types of patterns: Regular and Alpha. Both of them are super easy to make and generate. The basic difference between alphas and normal bracelets is the way that they are tied. A normal pattern has a diagram. To read the diagram, use the colors at the top of the bracelet diagram. You should always pair up all the strings and always work side to side. Working diagonally will get confusing, so it's best to take it row by row. One knot will always be tied over it's neighbor string. The little triangles on the sides mean to leave the last two strings to the side and use different pairs. An alpha pattern has a grid. Instead of tying one knot over it's neighbor, you tie the background string over all the letter strings. To make the image, tie the letter string over the background sting when it's time to use the letter string. The letter string knots should be the opposite knots used for the background string in that row. 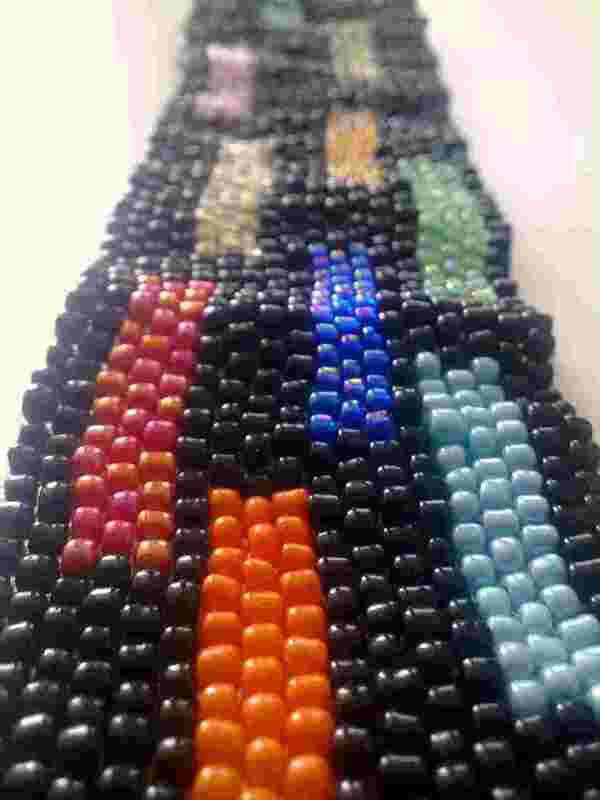 For further help on alpha bracelets, check out the tutorials on alpha patterns and multicolour alpha patterns. This girl has an excellent tutorial on doing the four basic knots in patterns. The original author of this tutorial is superc, but it has also been edited by Carrie, Foz, Gracie04, Freakyy, Dodadoo, k_marie, Kestrel, Alicat and kleinevos. The tutorial was last updated 4 years ago.